Discussion in 'POTW Collaboration' started by Serebii, Dec 2, 2018. Zapdos is a cool Pokémon, even since Gen 1! It has gotten better with the gens thanks to new moves added, like Heat wave and Ancientpower, which give it more coverage. With Heat wave, it can counter Ice-types and Steel-types. the first is a weakeness, and Steel is very resistant to its other moves. With Ancientpower it can boost all its stats with a lucky boost, making Zapdos dangerous and stronger! It can also be used against Fire-type Pokémon for super-effective damage, coz Ice, Bug, Flying are already covered with its other moves (Heat Wave, Thunderbolt or Drill Peck/Fly). I personnaly love the Fly/Pressure combo to drain PP from the foe.... but Drill Peck is great too! It's importantto be mixed Physical / special, as you can face more foes that way! And Zapdos is good at both. also, Zapdos has great support moves, like Roost, Light Screen, Thunder Wave, etc. Choose which one you prefer. Zapdos has been a consistently stronger and absolute monster as a mixed attacker and a defensive attacker. You could say in terms of Competitive Pokemon, Zapdos is arguably the most famous mixed and defensive attacker starting it's debut in Gen 1 however many still choose to focus it's incredibly good special attack over it's physical bulk. 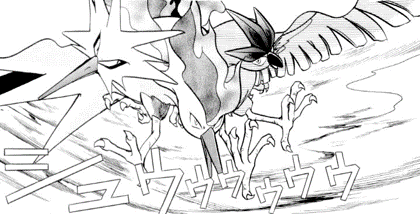 In the Power of One movie, Zapdos grabbed many fans attentions serving as a temporary antagonist but for other Pokemon fans, Zapdos captured many people's attention in the Pokemon Adventures manga, playing not one but two major story roles during the Pokemon Adventures RGB and GSC chapter temporarily owned by two separate trainers. Can you guess who they are? In the RGB chapter, it made it's most impactful appearance during the absolutely amazing Siege on Saffron City storyline where Red, Green and Blue, the original Gen 1 protagonists, work together to put an end to Team Rocket's most powerful stronghold Saffron City through infiltration, outsmarting the Rocket Gym Leaders and last but not least dealing with the terrifying Thu-Fi-Zer, a three-headed bird fusion of Zapdos (Thunder), Moltres (Fire) and Articuno (Freezer). 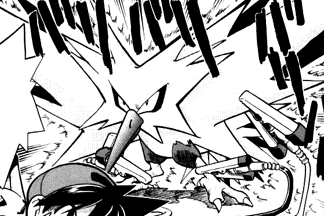 It was during this chapter that Surge, one of the Rocket Gym Leaders, used Zapdos's flight and powerful electricity as a power source for his tech in the Pokemon Battle against Red while flying high in the air. That was surely no easy fight but it only gets harder for Red & friends later as Zapdos fuses with Articuno and Moltres to become Thu-Fi-Zer, Team Rocket's last resort as it scares Blue (female protagonist) due to her mysterious fear of bird-like Pokemon. Luckily the three make it out okay, defeating the powerful fusion. However it doesn't end there, it just continues making an impactful appearance in the GSC story arc where it is revealed that Blue has overcome her fear of birds by battling and capturing the legendary birds themselves and oh boy it gets even better. During the final battle, we get to see Red, Green and Blue command the three Gen 1 legendary birds as they take on the much more powerful and fearsome tower duo, Ho-Oh and Lugia, to the skies. During this battle it is rival Green who commands Zapdos. 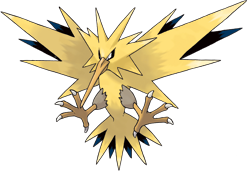 To this date, it is arguably Zapdos's and by extension the other legendary birds greatest appearance in any Pokemon medium, even possibly over the games. As the reference to the Pokemon Adventures fusion implies, Zapdos has access to Thu (Thunderbolt), Fi (Heatwave) and Zer (Hidden Power Ice) representing Zapdos, Moltres and Articuno who form the intimidating fusion known as Thu-Fi-Zer. Zapdos has an amazing typing paired with amazing stats and an amazing movepool that makes Zapdos the most competitively-viable legendary bird out of the three. Many powerful ground-types have absolute trouble dealing with this monster. Even popular sweepers or offensive tanks like Landorus and Garchomp will have great difficulty getting through Zapdos thanks to it's ground-type immunity and it's access to recovery and hidden power Ice. For some people however the Timid Nature and Speed is far more important as it gives Zapdos faster access to Roost as long as your aware that using roost will leave Zapdos vulnerable to the dreaded earthquake. Be it extra speed or extra defense, either way Zapdos is absolutely hard to take down due to not only it's good stats and typing but it's offensive power too boasting a staggering 125 Sp. Atk. As mentioned before Hidden Power Ice puts a stop to popular ground-types like Garchomp and Landorus who has a 4X weakness to Ice. Although not every steel-type is Scizor or Ferrothorn, Heatwave is still recommended as it is decent type-coverage against ice and steel-types who may pose an obstacle to Zapdos. And of course one cannot forget about Zapdos's STAB Thunderbolt as it adds more to Zapdos's status as a tank against water-type tanks, able to 2-shot tanks like Suicune. You may want Discharge during doubles but you won't get the same effective two-shot results against popular water-type tanks as thunderbolt. However Zapdos isn't perfect. Zapdos is a good physical tank, not a physical wall meaning there are some Pokemon that can still one-shot it. A great example is Weavile. Even if Zapdos is full invested in HP and Defense with a physically defensive nature, Weavile has a 6.3% chance of one-shotting it with Icicle Crash. Even if Zapdos revenge kills it, it should give you an idea how fast offensive Pokemon with good STAB can absolutely tear through Zapdos's physical defenses depending on the EV spread. However one must still not underestimate Zapdos in the end as Weavile makes up only one of the very small selection of very strong and effective counters against Zapdos. If you play competitive Pokemon then you know to never underestimate an effective tank cause if you don't have decent counters against Zapdos, you possibly have already lost the match before it started as this Pokemon shows no mercy for the reasons stated previously. I'm still bitter about the fact Zapdos' Hidden Ability changed to Static from Lightningrod - what was even the point? I think it's a bit of a nerf in an attempt to keep the balance. It's still very powerful compared to Articuno and Moltres, but Electric immunity on top of that might have been too much. Most Zapdos you see in the Sun series are some variation of this set. An Electric STAB move, Heat Wave for spread damage coverage, Tailwind for speed control (one of the main reasons of running it), and the final move is one of three things. Roost can give recovery and can be helpful if you have Tapu Fini or Tapu Koko in your team to dodge Spore for a turn (Roost grounds you so you benefit from the terrain), it's mostly helpful for more defensive builds, Roar is helpful to get rid of Xerneas setting up Geomancy, and Protect is Protect. There are different ways of running it. You can run Life Orb and run it offensively, or a pinch berry for a more defensive approach. The nature can also be varied, Timid is nice for speed, but if you count on Tailwind a defensive nature like Bold or Calm is also viable, and Modest is also run at times. Unfortunately for Zapdos, it suffers from quite some competition from other Tailwind setters. Lunala has a lot more bulk thanks to Shadow Shield, has more offensive presence, and is immune to Fake Out. Ho-Oh is also occasionally used and has more special bulk and Sacred Fire. Kartana is sometimes seen as a Tailwind setter too, and Kartana can destroy Kyogre and Xerneas with its STAB moves. Yveltal is also used as Tailwind setter and has more offensive power and priority in Sucker Punch. Tornadus-Incarnate is frequently used as a Tailwind setter and has Prankster to get it up reliably. Tornadus can also Taunt foes like Xerneas and Amoonguss and threatens Ludicolo with Hurricane. Crobat is incredibly fast, can't flinch from Fake Out thanks to Inner Focus, also has Taunt, has useful offensive support with Super Fang, and can Haze setup. Zapdos suffers in trying to find its own unique niche in there. It's not necessarily bad, but it doesn't fit the meta flawlessly either. Ah, Zapdos, the best of the 3 legendary brids, and the only one without a 4x weakness to rock. Yeah, that plus making Articuno the defensive one of the trio was a nail in their coffins, as the Electric Flying type is really good (ignoring the Pika Clone and the Rotom form with the Redundant ability) as it protects against both Flying spam and the ubiquitous Earthquake. As most set options seem to have been covered already, I'll just go over other moves of note. Defog -While Zapdos hates Stealth Rock, being able to remove it, along with screens is always a nice perk. For novelty, may be combined with Flynium Z for more accurate Thunders and Heat Waves. Tailwind/Thunderwave -Zapdos has two speed control options, making it great for getting the upper hand on an opponent. Reflect/Light Screen -Zapdos actually gets Reflect in Gen I. This makes it a possible contender for dual screening, but that role can be better handled by other pokémon. I think Ancient Power is very situational on Zapdos and not worth it. The stat boost is neat, but 10% is just too low to count on. Aside from hitting Volcarona hard I can't think of many things that it actually hits, as a neutral Thunderbolt actually hits harder than super effective Ancient Power, and a x2 Thunderbolt hits harder than a x4 Ancient Power (against the likes of Ho-Oh and Mega Charizard Y). I guess it sort-of covers Reshiram and Mega Charizard X (and Turtonator), although max Sp.Atk Life Orb Zapdos doesn't always 2KO Reshiram with it, showing just how weak it is without STAB or a 4x super effective hit, that's purely due to low base power. On more defensive Zapdos sets with a pinch berry or Leftovers it might not even 3KO Reshiram (and that's Reshiram with no bulk investment, if it's a bulkier variant for instance for Trick Room or Tailwind support the damage is even lower). Zapdos also needs the Life Orb to get the KO on Volcarona. Zapdos is very much an attacking Pokémon above anything else. It beats out Articuno and Moltres for two major reasons; its speed and its lack of that 4x Rock weakness. Outside of moves like Roost and Protect, I don’t see a reason putting that many status moves on it. Reflect/Light Screen -Zapdos actually gets Reflect in Gen I. This makes it a possible contender for dual screening, but that roll can be better handled by other pokémon. Another good option, and one that I use on my Zapdos, is Discharge. Discharge may not be as powerful as Thunder or Thunderbolt but the high rate of paralysis makes it a good option for status and speed control. Yeah which is why they are other options and usually niche. Discharge is likely preferred over Thunderwave for reasons that Det. Viper stated and Tailwind is better in Doubles. As I noted, other pokémon perform the dual screener role better, but Zapdos is a notable screener due to the fact that it resists Brick Break and can easily KO most users of Defog. I am not sure if this is the place to post this, but on the PotW page for Zapdos, the first moveset is impossible for Zapdos, as Zapdos doesn't learn any of those moves. I think that is a moveset for Mew.